The old topo above is before the old 1922 dam was breached. 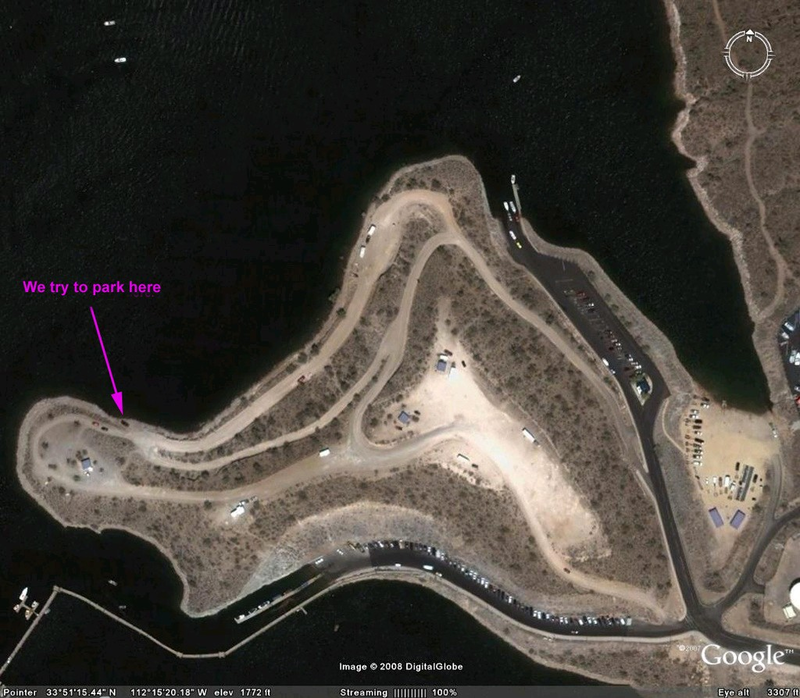 As you can see, Vista Point is roughly in the shape of a dogs head (in red current shore line). “The Trench” (in yellow), is a ravine that ran down to the river. The dark lines are 100’ apart, each line 20’. The area in green is now about 180 to 240 feet deep (when the water is up). Green indicates trees. Yes, they are still down there. As you can see, depth can be had quickly here. I would still favor the east side over say desert tortoise. The water seems to always be clearer on that side. Plus you can find depth easier. You can only get in on the North side. Drive up the hill at the entrance of the Marine docks and drive around to the north side. There is a “driveway” into the water at the west end but is usually filled with students on the weekend. I personally like to go to the East end of the road just before the road starts going back up. If you take a heading to the end point of the opposite bank (I think its about 330) you will get into a slot that goes out to a ledge which drops from bout 80 to 110. Hope to see you guys out there. I’m out there pretty much every saturday morning. My partner and I dive CCRs so we are hard to miss. Bob F.“ Dove Vista Point this morning with Clay and Mike. Beautiful morning, little wind and few boaters. Water was warm down to 25 feet. Visibility 15 to 25 feet. Water level a few feet lower than last week at this time. Came across a monster catfish lying under a fallen tree. The head on this thing was at least a foot wide, maybe 40 to 50 pounds. Alot of bass in the shallower water.